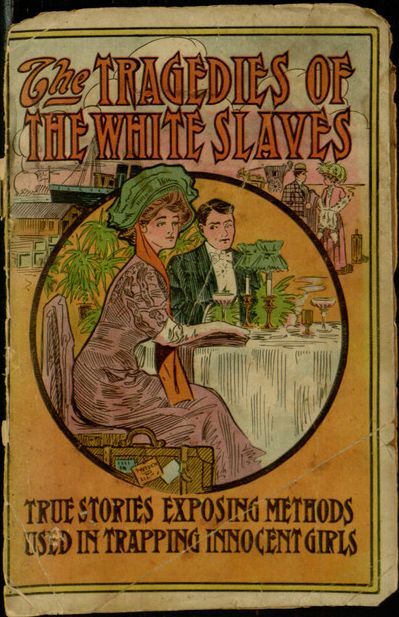 Our latest completed project from Distributed Proofreaders is Tragedies of the White Slave, an inexpensive paper-covered volume from 1909 that seems to fall into the same category as early “cautionary” films like Reefer Madness, adopting a highly moralistic tone while also providing shocking-for-its-time accounts of taboo topics. Although the title page promises “ten tragedies of ten girls,” the book actually delivers six single-chapter anecdotes and a seventh tale split into six additional chapters. All claim to be true stories, and the long piece, about Irish lace-maker Ella Gingles, does appear to refer to a real case that was covered in such papers as the Chicago Tribune and the New York Times, among others. The author, Hal Mcleod Lytle, also appears to be a real Chicago Tribune reporter of the period, based on a search of the Ancestry database. The premise of the book is that big cities, and in particular, Chicago, harbor a widespread and efficient industry specializing in entrapping young girls into forced prostitution. Human trafficking remains a real (if controversially-defined) problem, and undoubtedly some of today’s problems were already brewing in 1909 (and earlier). However, many of the anecdotes here resemble dime novel melodrama more than believable criminal activity, suggesting that, at best, this is a loose mix of fact and fantasy. Significantly, the real case involving Ella Gingles seems to offer a lot more ambiguity and room for alternate interpretations than the shorter, more apparently fictionalized or generalized stories. If nothing else, this book offers an interesting view of how some particularly horrific subjects were viewed and portrayed in a much more conservative time, and it might also provide some starting points for deeper research into how reality and public perception differed on the subject of the exploitation of women during this period.